Last Friday, the Senate Judiciary Committee met hours after the hearings of Supreme Court nominee Brett Kavanaugh and his accuser, Christine Blasey Ford, to determine the trajectory of Kavanaugh’s confirmation. The committee would vote on whether to recommend that the full Senate approve Kavanaugh’s nomination, reject Kavanaugh’s nomination or the committee could offer no recommendation at all. On the 21-person committee, Sen. Jeff Flake (R-Ariz.) was seen as the lone swing vote in the line up of 11 Republicans and 10 Democrats. And early Friday morning, many were still waiting with bated breath to see how he would vote. And then the news broke. Flake confirmed that he intended to vote for Kavanaugh. But it’s what happened before Flake’s vote that had people talking. Flake had a fiery confrontation on his way to go vote on the issue, after being confronted by two sexual assault survivors. CNN journalist Suzanne Malveaux was there to witness it all. Malveaux recounted for CNN how she met the two women who ultimately would become the faces of resistance in front of Flake’s office: Ana Maria Archila, a New York City activist who had been attacked when she was five years old, and Maria Gallagher, a recent college grad, who also had her own survival story. 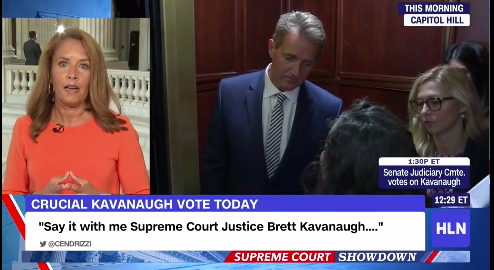 As Flake attempted to get on the elevator, Archila stepped in the way, preventing the elevator from closing and blocking Flake’s exit. Flake was stuck. Having to explain his position. In this small, hot, enclosed space which quickly filled with raw unbridled, unscripted emotion. “You have children in your family. Think about them. I have two children. I cannot imagine that for the next 50 years they will have to have someone in the Supreme Court who has been accused of violating a young girl,” Archila shouted. “What are you doing, sir? “I was sexually assaulted and nobody believed me. I didn’t tell anyone, and you’re telling all women that they don’t matter, that they should just stay quiet because if they tell you what happened to them you are going to ignore them,'” she shouted. “That’s what happened to me, and that’s what you are telling all women in America, that they don’t matter. The two took turns confronting Flake, as the elevator buzzed, and his aides tried to push any button that would close the doors. Flake was seen on the elevator with his head lowered, avoiding the women’s gazes. “It was surprising. It was shocking to us because it was totally not anticipated. We were asking the Senator a question when he was in the elevator and one of the women was able to put her foot down, allowing this opportunity for her and the other sexual assault survivor to confront him directly,” Malveaux told ESSENCE, in an exclusive interview. For Malveaux, experience and instinct took over as she realized that any question she had was not as necessary in the moment as the emotion, passion and frustration that these two survivors were showing to the Senator. In the end, Flake did eventually make it to the committee to vote, however throughout the proceedings leading up to the vote he looked uncomfortable and unhappy. He then slipped away from the room. Murmurs started circulating that he was meeting with Democrats ahead of the vote. Ultimately he still voted to move Kavanaugh’s nomination to the full Senate but insisted that a limited FBI investigation be held into the sexual assault allegations against Kavanaugh. “I think it would be proper to delay the floor vote for up to but not more than one week in order to let the FBI continue to do an investigation limited in time and scope to the current allegations that are there and limited in time to no more than one week,” he said at the time. And the sudden change was something that stood out to Malveaux, the change that these women were able to bring, even if it was just for that moment, through their bravery.